(Nanowerk Spotlight) Everyday challenges in medical and surgical practice involve stopping bleeding, closing wounds, and repairing organs. Various hemostatic agents, sealants, and adhesives have been developed to provide easier, faster, and more pragmatic approaches of tissue closure. Usually, these chemical closure materials – which need to be biocompatible, biodegradable, stable, and meet regulatory requirements – work as glues which bind tissues together to progress the natural healing. Once the chemicals are applied on wounds, washing or immersing wounds in water has to be avoided, and difficult decisions may arise where closure materials are not easy to remove and where the dose to the underlying tissue may significantly exceed the relevant maximum permissible dose. Nanotechnology research already has begun on this issue, resulting for instance in a method that employs gluing by aqueous nanoparticle solutions to effectively control bleeding and repair tissues. 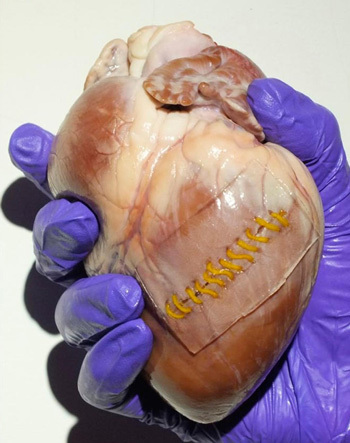 Another nanotechnology sealant that allows scar-free surgery is based on a biodegradable thin film of only about 20 nanometers thickness that could replace surgical stitches. In new work, reported in ACS Nano ("Octopus-Inspired Assembly of Nanosucker Arrays for Dry/Wet Adhesion") a group of researchers in Taiwan demonstrates an uncomplicated and scalable templating technology for fabricating non-close-packed nanosuckers on PDMS substrates. These templated nanosucker arrays exhibit great adhesive capacities on both dry surfaces and wet surfaces. In addition, resulting from the good flexibility of the PDMS, the nanosuckers can be deformed and generate an adhesion force on microrough surfaces. The technology is compatible with standard industrial manufacturing and provides a platform for varieties of medical applications ranging from hemostasis, wound care, and wound nursing. Millions of years before people began to create functional structures, natural biological systems developed many architectures to produce functionalities by years of evolution. For instance, octopus arms, consisting of non-close-packed centimeter-scale suckers, can attach to objects in order to anchor the octopus body to substratum or manipulate, investigate, grasp, and collect prey. The adhesion is generated by the suckers attaching to a target, forming a seal at the rim, and then inducing a negative pressure in the acetabulum regardless of the target surface materials. Inspired by these octopus arms, the researchers from National Chung Hsing University developed a nanosucker array using a scalable spin-coating technology, which enables large-scale fabrication of non-close-packed colloidal crystals. 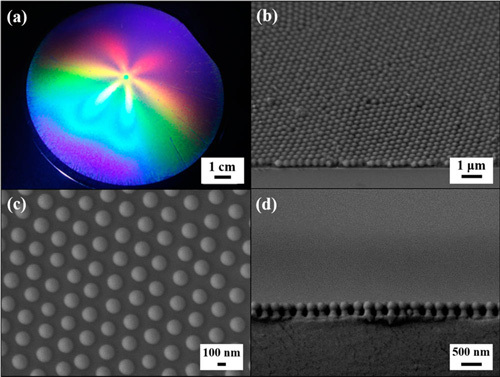 The team realized this bottom-up self-assembly methodology by shear-aligning concentrated silica colloidal suspensions with 20% silica particle fraction. After further processing, the resulting PDMS film with arrays of nanosuckers is capable of forming seals even on uneven surfaces. As the nanosuckers are pressed against a substrate, the flexible nanosuckers confirm to the substrate and deform by releasing the internal air between nanosuckers and the substrate, forming a seal and generating an adhesion force. The researchers point out that the nanosucker adhesion is maintained over multiple contact cycles on both wet and dry surfaces. As a proof-of-concept application, once the nanosucker array is pressed against a porcine heart, the nanosuckers can generate an adhesion force. The optically clear film dressings allow readily and easy inspection on wound healing progress and any drainage for optimal healing.